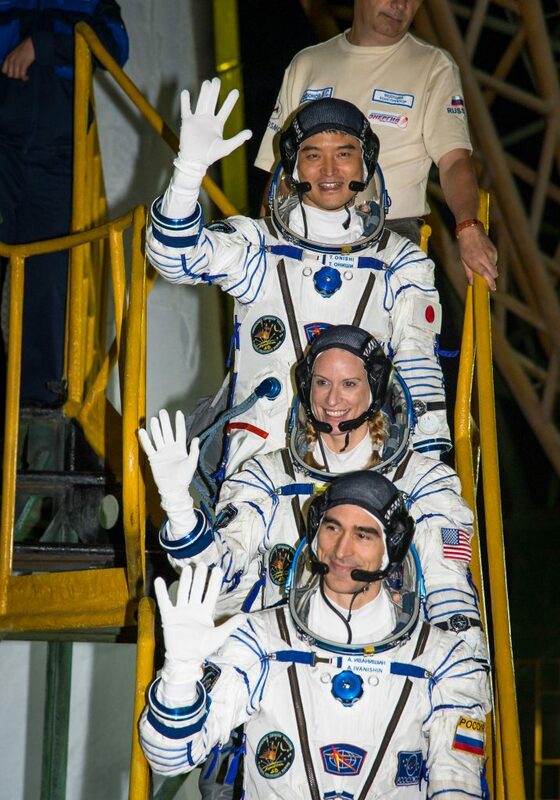 A veteran Cosmonaut, a former Japanese airline pilot and a trained microbiologist from the United States safely arrived in orbit after riding atop a Soyuz FG rocket blasting off from a remote launch pad in Kazakhstan Thursday morning. The international crew trio is set for a two-day approach to the Space Station for docking on Saturday to live and work in space for the next four months. Thursday’s launch marked the 130th of Russia’s Soyuz spacecraft, in charge of ferrying crews to and from space stations since the 1970. 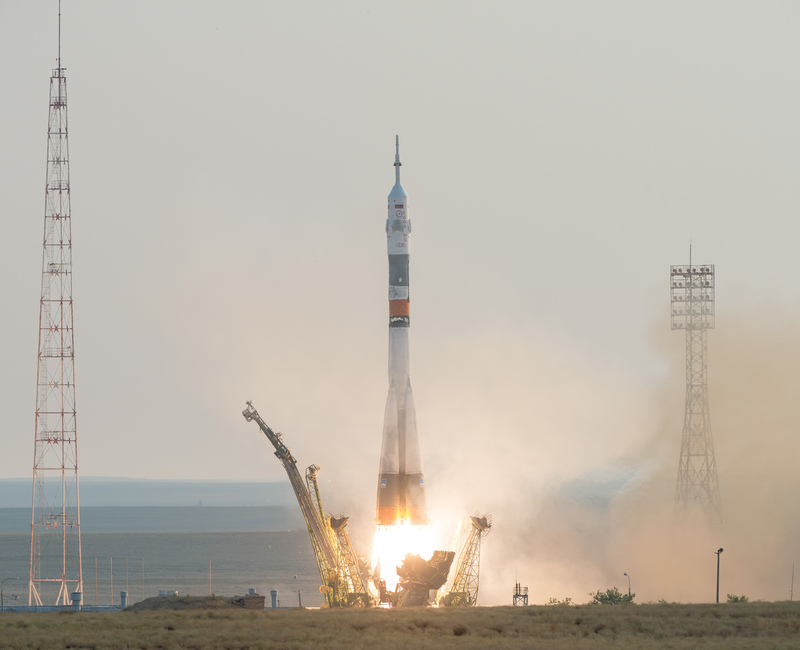 The 49.5-meter tall Soyuz rocket made a thundering summer morning liftoff at 1:36 UTC, 7:36a.m. 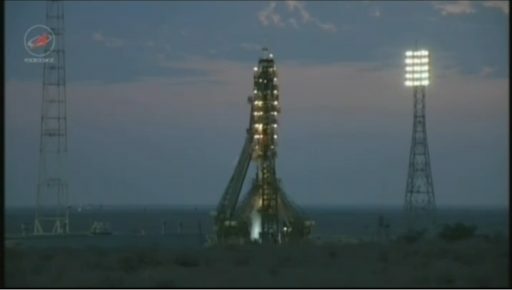 local time, climbing into clear skies over the Baikonur Cosmodrome to depart to the north east to place Soyuz into an orbit from where it can climb up to the Space Station in its 400-Kilometer orbit. Soyuz MS-01 – the first in the upgraded line of crewed spacecraft – separated less than nine minutes into the flight after a smooth ride for the three crew members. 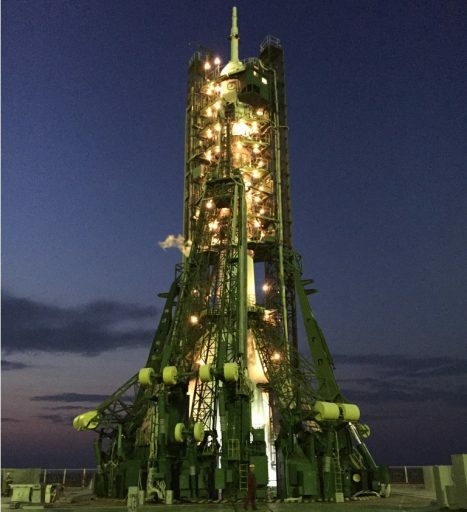 Setting up for a rare daytime launch of a Soyuz crew, engineers at Baikonur’s historic Site 1/5 put countdown procedures in work in the late hours of Wednesday, local time, preparing the vehicle for tanking and testing the various systems of the Soyuz rocket and spacecraft. By that time, the crew members were already awake and going through their personal preparations for liftoff, departing the Cosmonaut Hotel six hours before their T-0 time to head to Site 254 for suit-up. The Russian State Commission provided the ‘All-Clear’ for tanking after a final review of countdown operations and launch vehicle testing, allowing engineers at the launch pad to move into the two-hour fueling sequence. Propellant loading picked up just inside L-5 hours to fill the four boosters, the large core stage and the Block I third stage with a total of 274 metric tons of refined Kerosene and -1893°C Liquid Oxygen oxidizer. 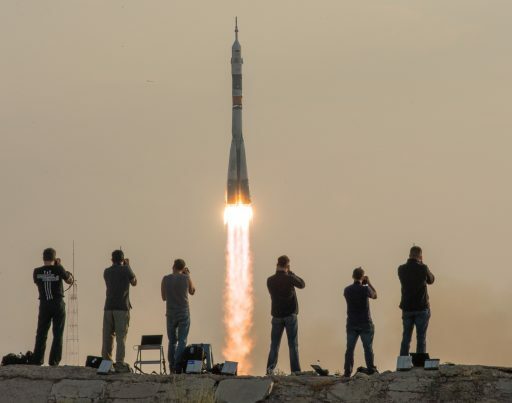 Walking in the footsteps of Yuri Gagarin who departed from Baikonur 55 years ago, the Soyuz trio closely followed the usual launch traditions that have been in place since the dawn of the space age. Reporting to officials in a setting that has not changed for decades, the three boarded a bus at T-3 hours, taking them to their ride into space. Towering atop its historic launch pad, Soyuz stood fully fueled when the crew arrived two and a half hours before their departure time – posing for a few photos before climbing up the Service Structure stairs and boarding the elevator to their Spacecraft. 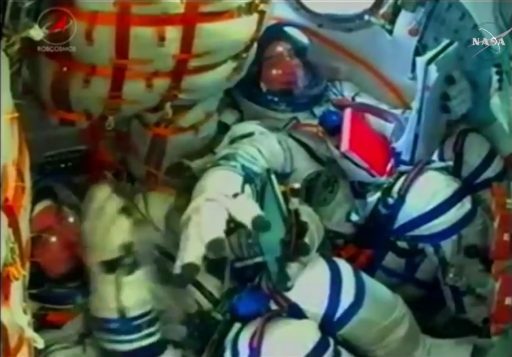 Taking the seat in the center of the small Entry Module, Anatoli Ivanishin was looking forward to second flight on the Soyuz, his first as commander. He became a Cosmonaut in 2003 after being rejected on his first application because he was too tall to fit into the Soyuz version flying at the time and needed to wait for a modified seating arrangement to make its debut on the Soyuz. His first space flight in 2011/12 lasted 165 days as part of ISS Expedition 29/30. Taking the Spacecraft Engineer’s seat on the left was JAXA’s Takuya Onishi who comes from a background in commercial aviation. He started out in the passenger service department before completing flight training and working as a pilot on the Boeing 767 aircraft until his selection in 2009. Kate Rubins – the 60th woman to fly to space – was seated on the right, also preparing for her first trip into orbit. A trained microbiologist, Rubins holds a Ph.D. in Cancer Biology and completed extensive research on viral diseases. Her work took her to Africa for several excursions to study viruses affecting this particular part of the world. As can be expected with her background, Rubins is mostly looking forward to the science she’ll be involved with on orbit, including the first experiments to sequence DNA in the microgravity environment and studies tracking the microbial environment of ISS. 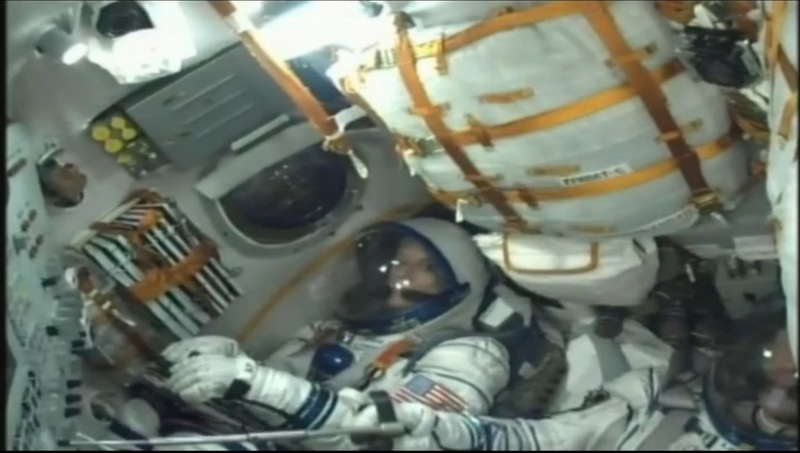 With the crew strapped in, hatches to the Soyuz were closed for a thorough leak check in progress while the crew worked through one hour of pre-launch setups. When all steps by the crew were complete, the trio sitting atop the Soyuz rocket was entertained with music pumped through the communications loop. 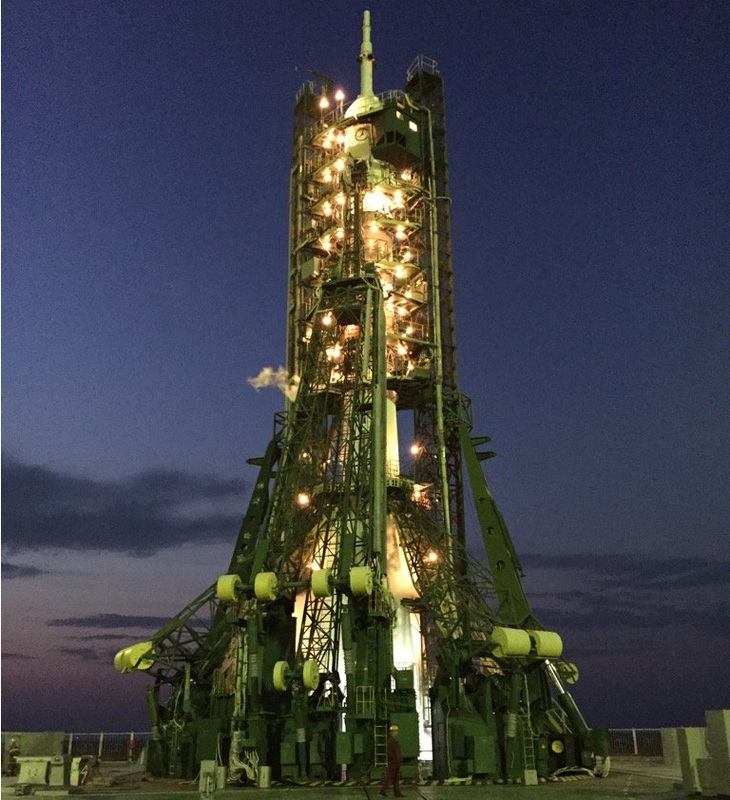 Outside the vehicle, engineers buttoned up the Soyuz rocket and retracted the two halves of the Service Structure before clearing the launch complex for the final countdown sequence. 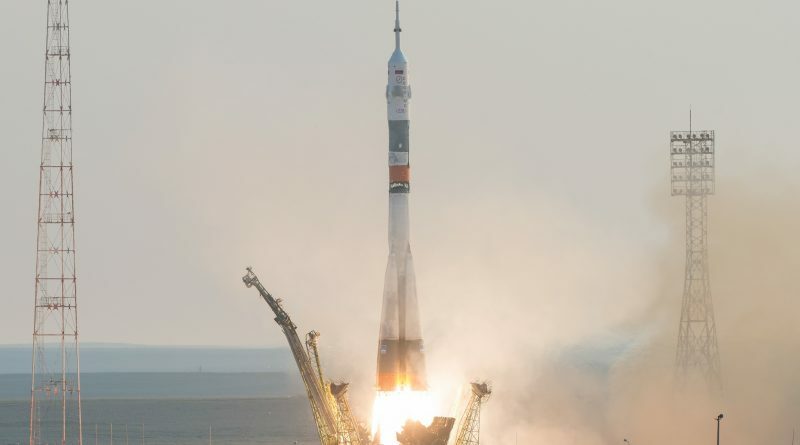 The insertion of a physical launch key – still employed by the Soyuz fleet – marked the start of a highly-coordinated final countdown sequence comprising the last reconfigurations on the rocket. The six-minute sequence kicked off with the activation of telemetry systems, the purge of the booster and core stage engines to ensure a controlled ignition and the pressurization of all tanks aboard the vehicle followed by the transition of onboard control. The umbilical towers swiftly retracted from the rocket and the engines fired at T-20 seconds, coming to life and soaring to a collective liftoff thrust of 422 metric ton-force. 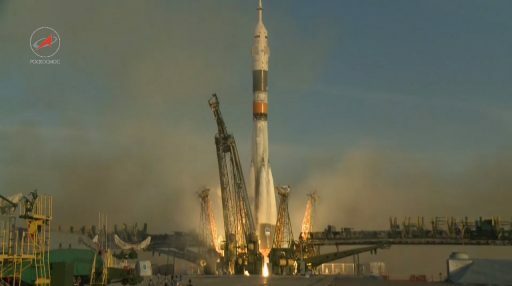 Overcoming counterweights when reaching launch thrust, Soyuz began rising from its pad. With over 1,800 flights over a career of over five decades, Soyuz is a world leader in the space launch business in terms of flight heritage and reliability, flying more missions than any other rocket family. Building on Sergei Korolev’s R7 design, Soyuz has flown crewed missions, cargo flights and satellite launches into all types of orbits. Powered by its four boosters and the core stage – all outfitted with four-chamber engines and smaller steering jets – Soyuz lifted off at precisely 01:36:40.208 UTC, powering uphill in an upright posture for ten seconds ahead of the pitch-over to a north-easterly departure path. Soyuz quickly passed the speed of sound and encountered Maximum Dynamic Pressure 49 seconds into the mission, its engines continuing to fire at full throttle, guzzling down 1,600 Kilograms of propellant each second of powered flight. One minute and 54 seconds into the flight, the Escape Tower was jettisoned by firing its separation motor and the SAS launch abort system transitioned to Mid-Altitude Abort mode in an architecture that provides abort options from before launch all the way through orbital insertion – requiring 11 recovery teams to be stationed along the vehicle’s ground track, from Baikonur to the Pacific Ocean. The four boosters shut down their RD-107A engines one minute and 58 seconds into the flight after each consumed 39,600 Kilograms of propellant to help accelerate the rocket to a speed of 1.5 Kilometers per second. Pyrotechnics and pistons separated the 19.6-meter long boosters and pushed them outward, away from the core stage, to enter a tumble back to Earth for a crash landing 348 Kilometers from the launch site. 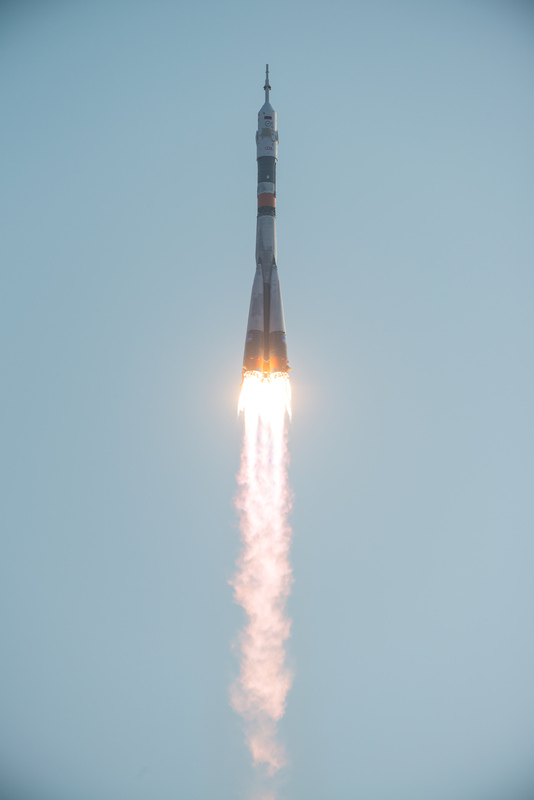 Soyuz continued powered flight relying on its RD-108A engine to generate 102 metric ton force of thrust as Soyuz climbed through the rarefied upper atmosphere. By T+2 minutes and 40 seconds, Soyuz had reached 85 Kilometers in altitude and jettisoned its launch shroud, providing Onishi and Rubins with their first look at Earth and its thin atmosphere while still ascending towards orbit. Over the next two minutes, forces on the three crew members steadily increased as the launch vehicle got lighter while the 27.8-meter long core stage continued firing at full thrust, burning 91,000 Kilograms of LOX and Kerosene over the course of its operation. Forces peaked at 3.5Gs before the crew was catapulted towards the instrument panel at the moment the engine was cut off four minutes and 45 seconds into the flight. Next, the RD-0110 engine on the Block I stage fired up and the Core Stage was separated via pyrotechnic devices to head to a crash landing 1,500 Kilometers from the launch site. Starting out 170 Kilometers in altitude at a speed of 3.7 Kilometers per second, the third stage was tasked with lifting the stack into orbit, increasing its speed by another 4km/s. The launch bunker continued to report good operation of the launch vehicle throughout the 3-minute and 58-second burn of the 30,400 Kilogram-force engine. Soyuz reached orbit 8 minutes and 45 seconds after launch when the third stage shut down and the forces of raw rocket power suddenly subsided and the sensation of microgravity set in for the crew and their Zero-G indicator – Rilakkuma, a doll of a fictional character given to Takuya Onishi by his daughter. Flying under the callsign Irkut – named after a river near Ivanishin’s birthplace Irkutsk, Soyuz deployed its two power-generating solar arrays just seconds after separating from the third stage. The arrays – one of the improvements of Soyuz MS – host more efficient solar cells and increase the panel’s active area by over one square meter to deliver power to the various onboard systems.An additional battery assembly raises the power storage capacity of Soyuz by 20%. Mission Control kept close watch over the Soyuz to ensure all KURS navigation antennas deployed and the Unified Propulsion System pressurized to be ready for upcoming orbital maneuvers. In for the long rendezvous, the crew was given a GO to open their helmets and prepare for ingress of the Orbital Module where they will take off their suits and get settled for their two-day orbital link-up with the Space Station. Initial operations completed by the crew in the first two orbits include various systems checks including the SKD propulsion system and the manual flight controls aboard the spacecraft. 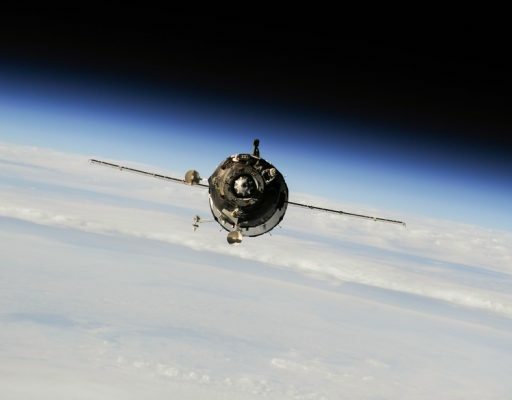 Aiming for the standard 200 x 242-Kilometer, 51.65° insertion orbit, Soyuz FG achieved a very close injection at a reported orbit of 199.03 by 247.13 km, 51.65°. 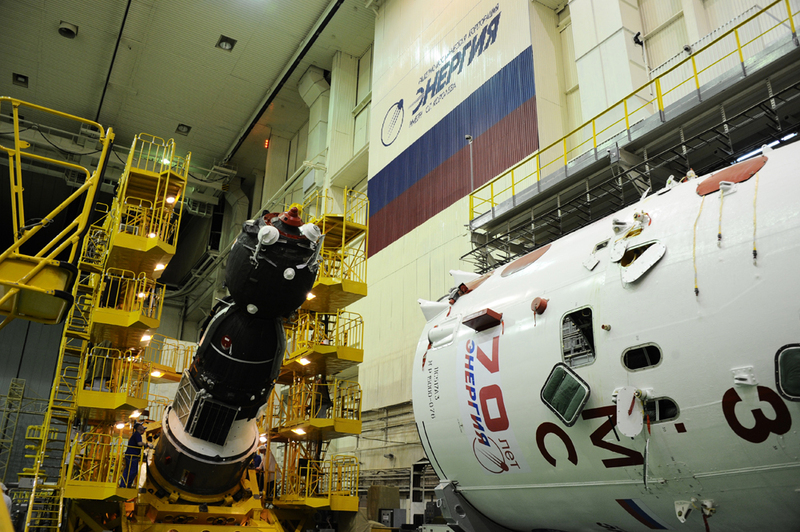 Soyuz MS-01 is set for a pair of orbit-raising maneuvers later on Thursday using its SKD main propulsion system. The Orbit #3 maneuvers are expected to last 58 and 56 seconds, respectively and aim to lift the spacecraft into a 284 by 305-Kilometer orbit where it will catch up with the Space Station. 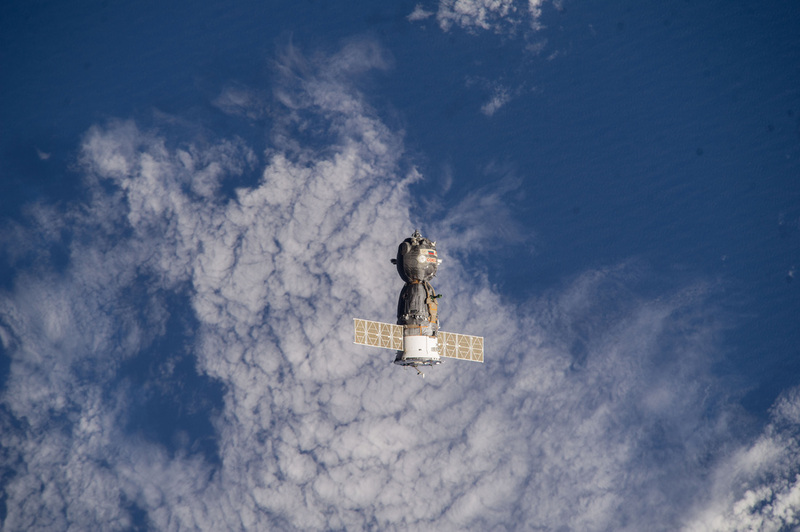 Waking up from a six-orbit sleep period, the crew will be set for a busy day putting the new Soyuz MS systems to the test in an operational environment. Flown on two unpiloted Progress missions, the MS upgrades are largely focused on the Navigation, Control and Communications systems of the spacecraft as well as small modifications to existing systems to make the vehicles more robust. The old Kvant-V radio built in the Ukraine makes way for a Unified Command and Control System, capable of communicating with Mission Control through the Luch data relay satellites in Geostationary Orbit. 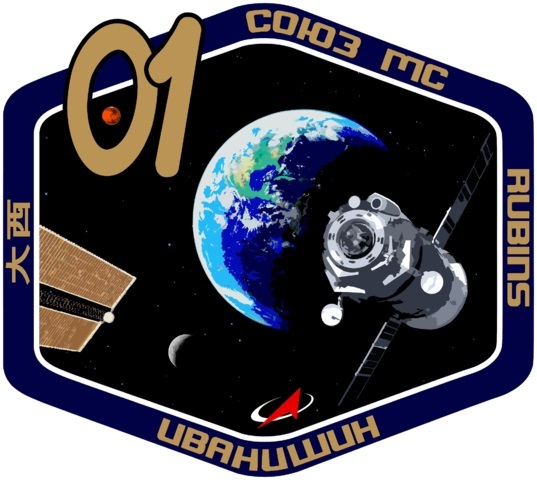 With the new communications system, Soyuz can remain in contact with Mission Control for around 70% of its orbit, a major improvement over 10 to 20-minute Ground Station Passes on around half the daily orbits. Satellite navigation is employed for state vector and orbit determination, allowing Soyuz to automatically target its engine burns. Proximity communications with ISS will allow for the exchange of relative navigation data to help in the rendezvous process and the new KURS-NA radio navigation system eliminates no-longer needed antennas and expands the system’s capabilities. An analog video processor is replaced with digital technology and the DPO thrusters are re-arranged into a pair of manifolds to add redundancy to the motion control system. Another change that may come into play later in the mission is an additional drive mechanism within the craft’s docking mechanism to make the system more fault-tolerant. The crew will work with Mission Control on Thursday and Friday to test out the various systems, both concerning hardware and changes to the flight software. Communications will be attempted through Luch and autonomous orbit determination parameters will be compared with tracking data to verify the system’s accuracy. Another engine burn occurs on Friday to put Soyuz into position to initiate its fully automated rendezvous sequence at 1:51 UTC on Saturday. A series of impulse burns will deliver Soyuz to the vicinity of ISS where KURS and relative navigation will be used to guide the craft to a flyaround of the orbiting laboratory. The crew hopes to be in a monitoring role only, but Anatoli Ivanishin will be ready to take control of the spacecraft at any point in the close approach to bring the Soyuz in for a manual docking. 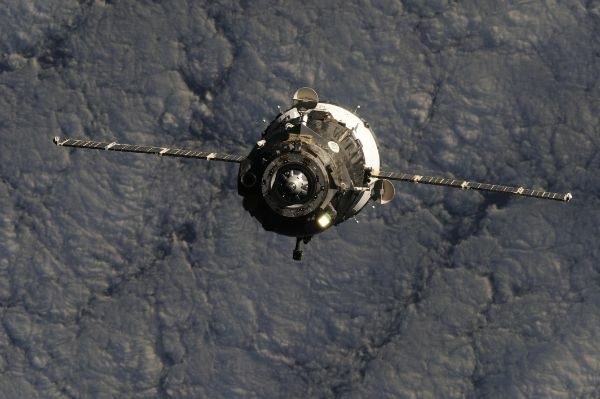 Docking to the Rassvet module is planned at 4:12 UTC on Saturday after what is hoped to be a smooth 34-orbit flight for the crew, spending two nights aboard the Soyuz. The crew is eagerly awaited by the first half of the Expedition 48 crew, Commander Jeff Williams and Flight Engineers Aleksey Ovchinin and Oleg Skripochka who are looking forward to working with the new arrivals for two months. Their mission starts out with visiting vehicle support as both a Russian Progress spacecraft and the SpaceX Dragon will be inbound before the end of the month to deliver supplies to ISS. One or two spacewalks are planned on the US Segment to install an International Docking Adapter needed by Commercial Crew Spacecraft for automatic dockings to ISS. Other than that, it will be full speed ahead for scientific experiments which are the primary focus of the Expedition 48 crew with around 200 studies active during their tenure.